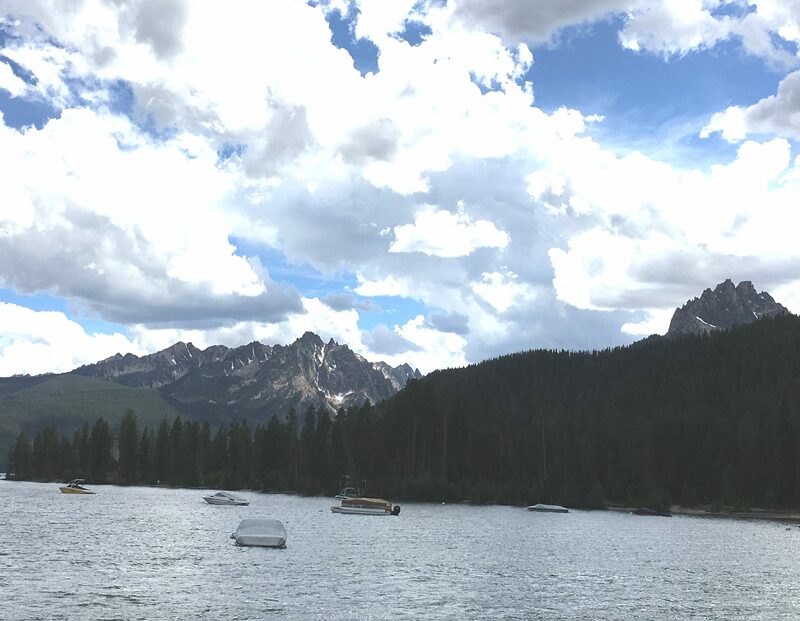 While those of us who live in Oregon are enamored with the beauty and variety of scenery in our state, a six-day summer road trip from Coeur d’aline to McCall and then to Stanley, Idaho convinced us that Idaho is not far behind. 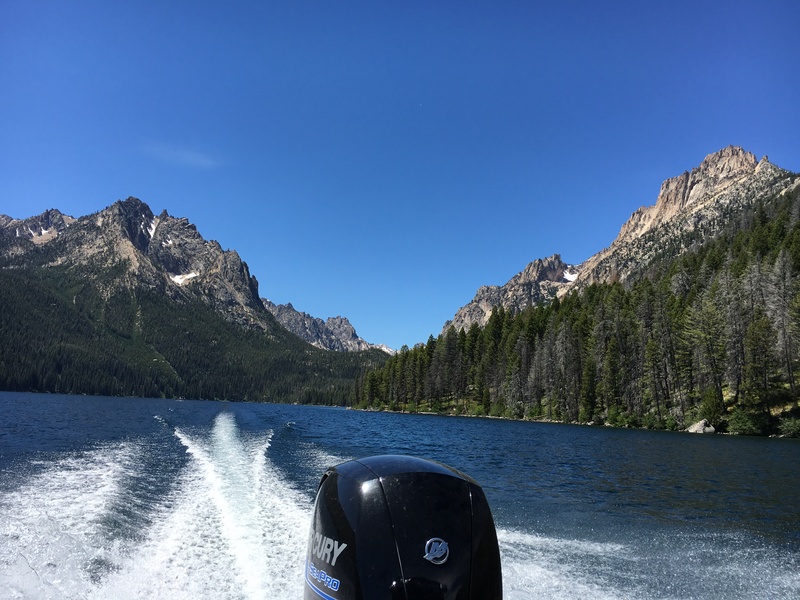 We followed the beautiful Payette River Scenic Byway much of the way from McCall to be greeted by the breathtaking Sawtooth Mountains surrounding Stanley. According to a website https://www.currentresults.com/Weather-Extremes/US/coldest.php the statements are not puffery. 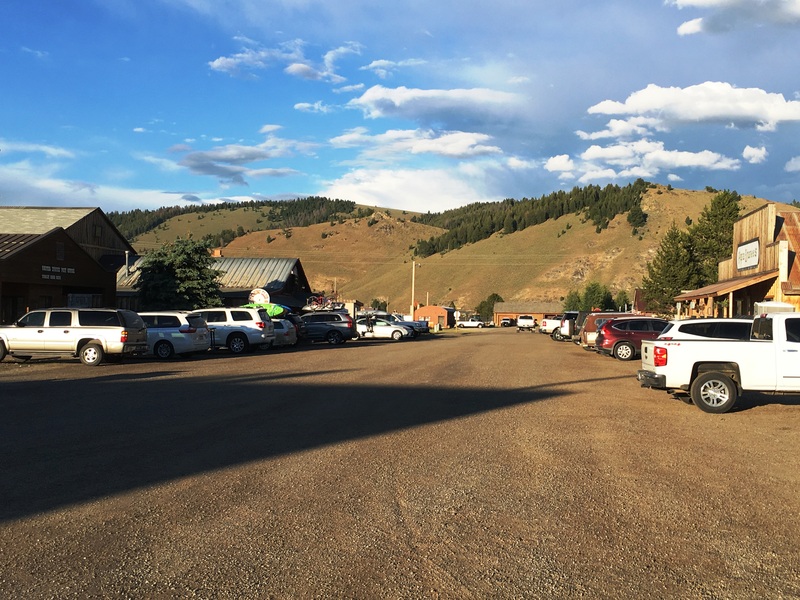 For example, “On any single day, the mountain town of Stanley, Idaho is most often the coldest place in the states outside of Alaska.” From 1995 to 2005, it was the coldest place in the US outside of Alaska for 398 days – more than any other location. 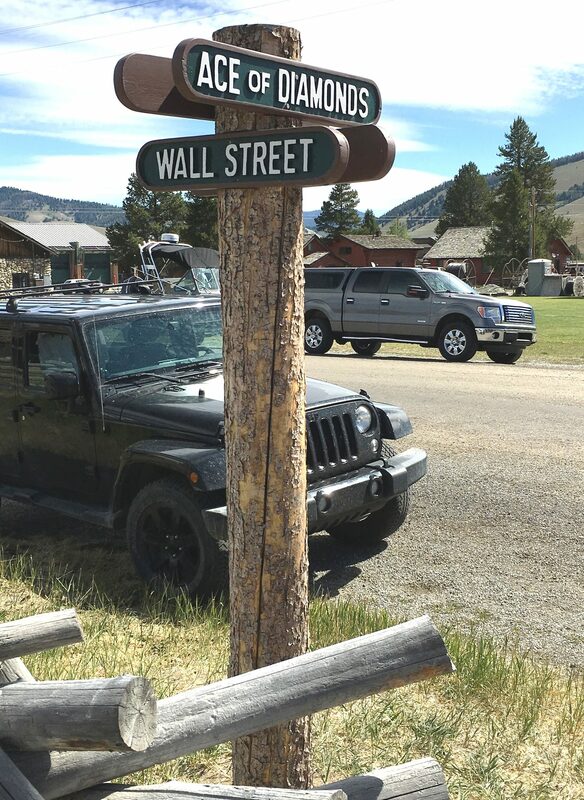 And if one stands at the corner of Wall Street and Ace of Diamonds, Stanley’s main intersection, you won’t observe stock brokers heading for skyscrapers, but a bunch of Suburus, pick-ups and jeeps parked in front of the several bars, restaurants and hotels which were all bustling when we were there. 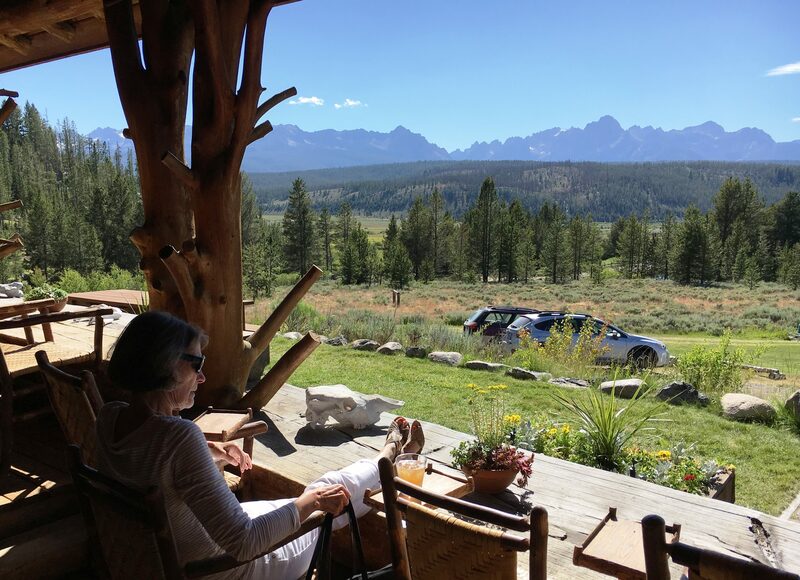 I was enthused that Janet could join me on this return trip – the first visit was thirteen years ago on part of my sabbatical from the Schwabe Williamson & Wyatt law firm, when I took an unforgettable road trip through Eastern Oregon, Idaho and Montana. 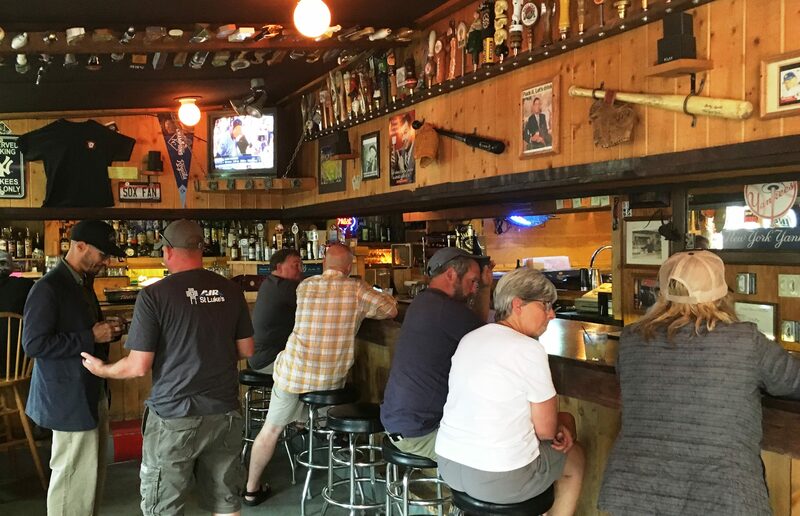 And thanks to Brian “Brain” King, one of my Schwabe colleagues, who urged me to spend time at the Stanley Rod and Gun Whitewater Saloon (SRAGWS) – one of the two dive bars that inspired me to start Thebeerchaser blog when I retired in 2011. While visiting Stanley years ago, Brian even took the stage and was lead vocal on “Blue Suede Shoes” with Jack. Of course Brian’s perfect pitch on such country–western classics as “She was a Bootlegger’s Daughter and I Love Her Still,” or one that is a favorite of legal clients everywhere, “If the Phone Don’t Ring, You’ll Know it was Me,” made him a natural to accompany Jack on stage at the bar. 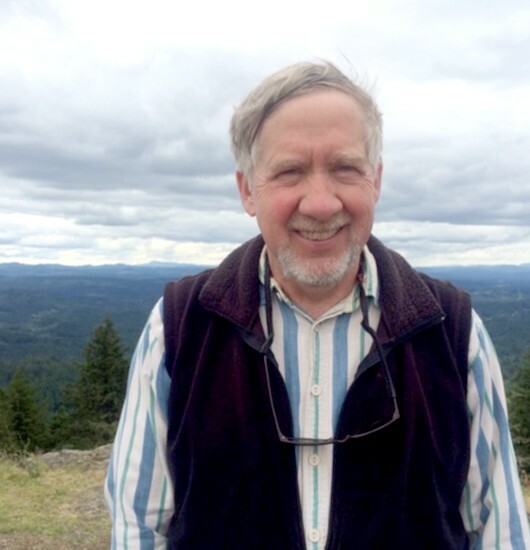 No, notwithstanding his legal skills and erudition, Brain is a down-home – dive bar kind of guy. 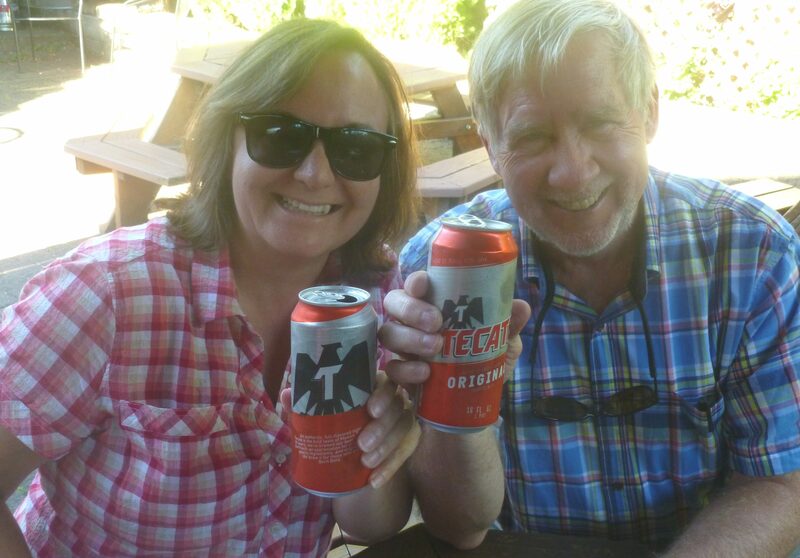 I found that out in our last Beerchasing journey when he was downing Tecate Beers in cans at Billy Ray’s Neighborhood Dive Bar in NE Portland. 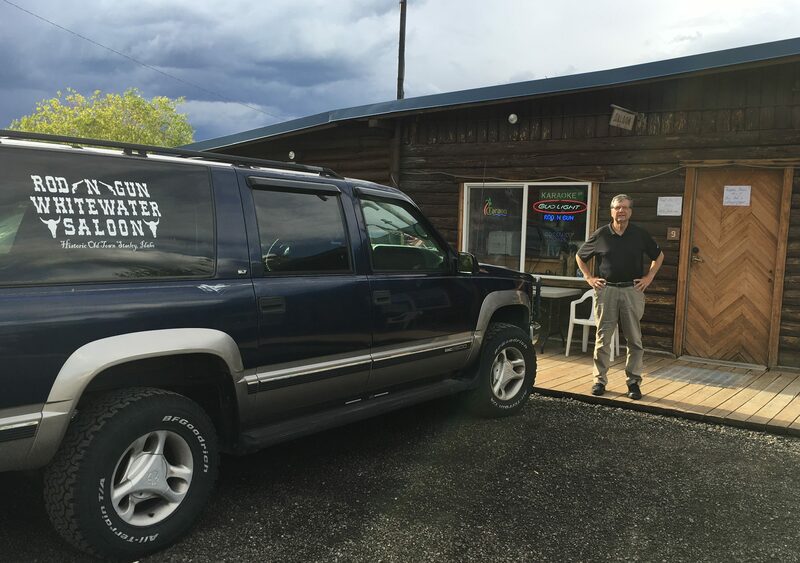 (See post dated 8/9/16 https://thebeerchaser.com/category/uncategorized/dive-bars/. When I was first at the bar on Karaoke Night in 2003, I did ask if Casanova Jack was in and the manager told me that Jack had died in 1990. The bar is now owned by his brother, Johnny Ray and his wife of thirty-eight years, Eve, who was also bartending while we were there. Johnny Ray played the bass guitar and sang in Jack’s group and spent a good amount of time filling me in on his story and that of the bar. 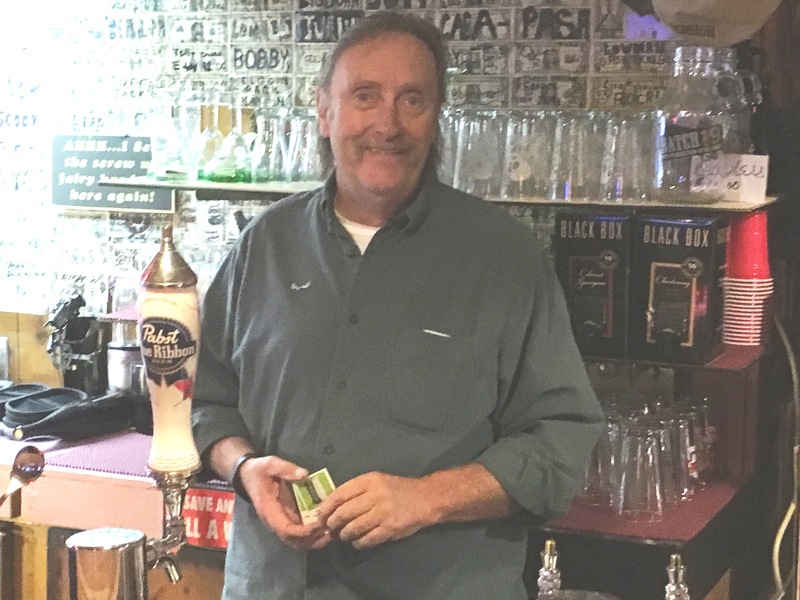 Johnny Ray – A new friend and talented musician and bartender….. The( SRGWS) has a long bar and large room with a stage for entertainers and karoke. 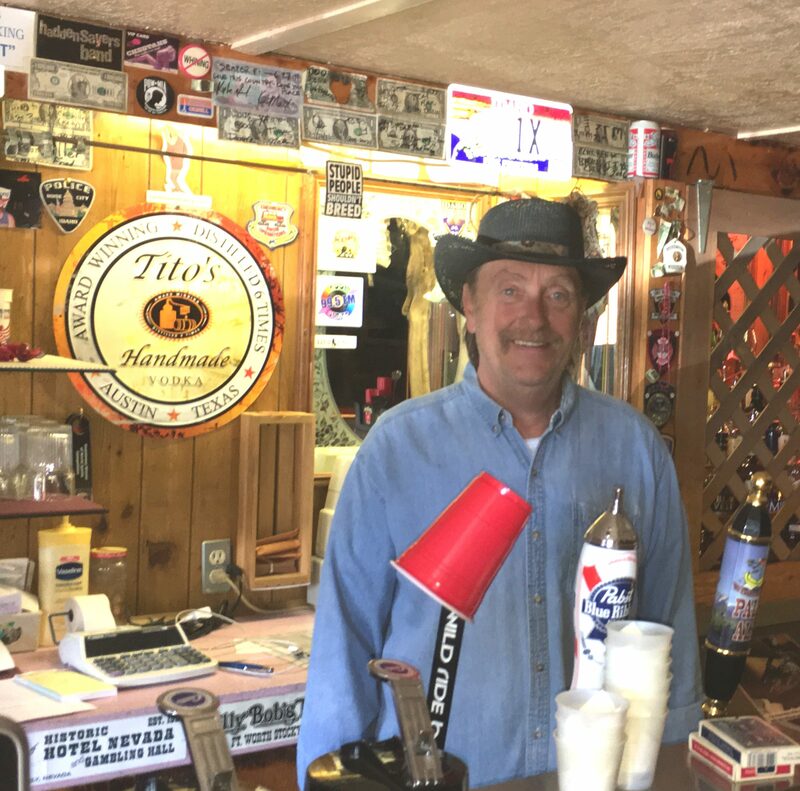 Johnny Ray is known as “Idaho’s Singing Bartender” and puts on a headset with a microphone so he can harmonize with the entertainers while he is bartending. 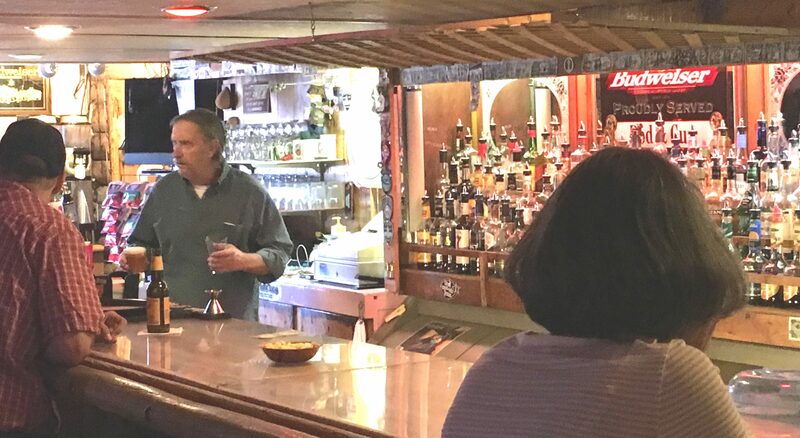 While Janet and I listened to wonderful stories from Johnny Ray, a group of regulars that afternoon were sitting at one end of the bar talking with Eve and echoing similar disdain for the political establishment. They were discussing the inability to purchase 22 caliber shells because the government is secretly stockpiling them at an unknown location. Instructions to one elected leader at the lower left…. 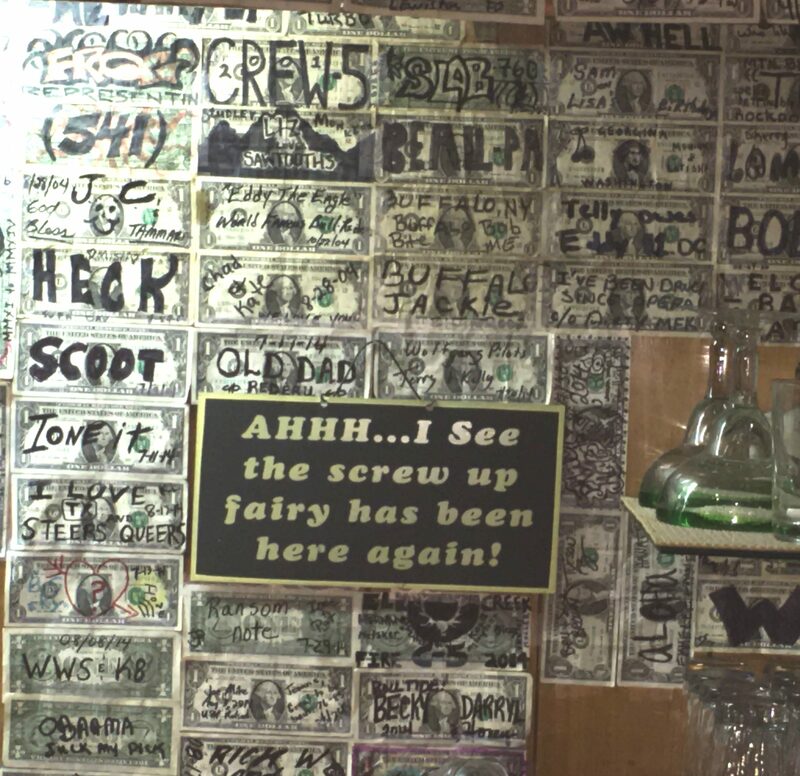 The walls of the bar are filled with hundreds, if not thousands of one-dollar bills which patrons sign and are hung on the wall – I did one thirteen years ago and on this trip, stapled Thebeerchaser’s card onto another one which Johnny Ray promptly tacked to the wall. One in particular I noticed would make both Republicans and Democrats blush at least a little. We came back the next morning after having breakfast at the legendary Stanley Baking Company and Café because I needed some additional pictures and the bar was closed. The bar is closed, but…. come on in! But after I knocked on the door, Johnny Ray, who was talking to one of his bartenders, let us in and chatted some more. He is a down-to-earth and colorful guy and Eve, is also a fine lady. If you visit Stanley drop in and say “hello,” with greetings from Thebeerchaser and look for my card on the wall. We also dropped into the other bar in ‘downtown” Stanley – the Kasino Club, which was also a good looking and well-frequented bar with ample space for evening entertainment. 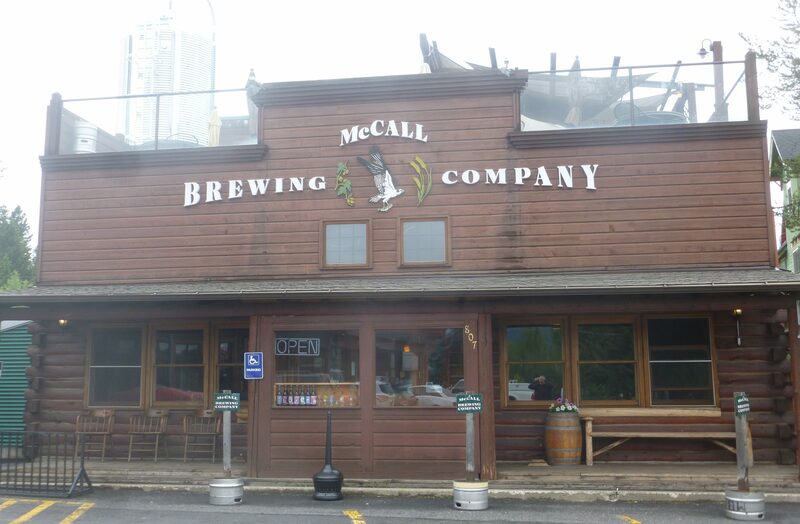 We wanted to say “hello” to Mikey – the friend of McCall Brewing Company’s Edgar and Louis, who we had met a few days before. He is a bartender there, but both times we dropped by, he was not working. 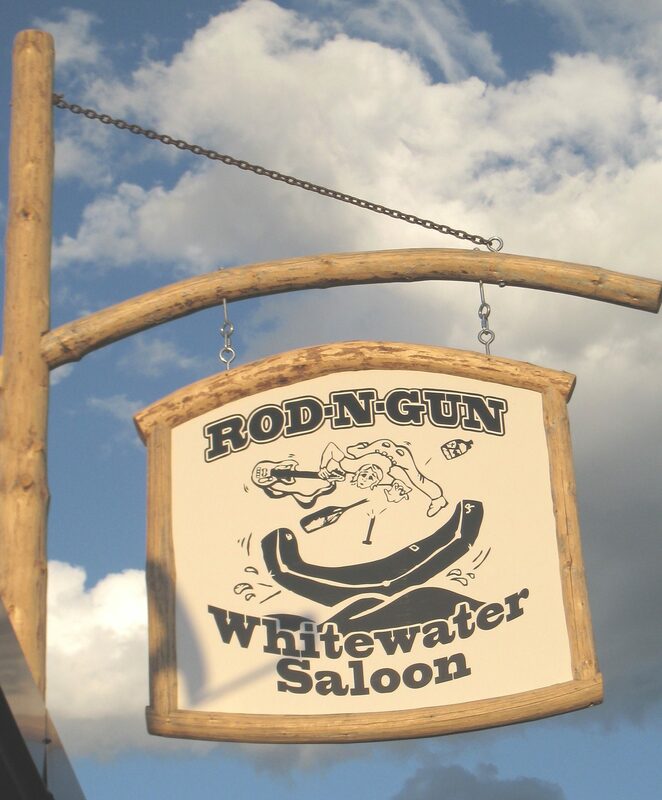 I also wanted to see it because I had heard that former Beerchaser-of-the-Quarter, Jay Waldron on one of his rafting trips on the Salmon River ended up on the dance floor with no shirt and no shoes some years ago. 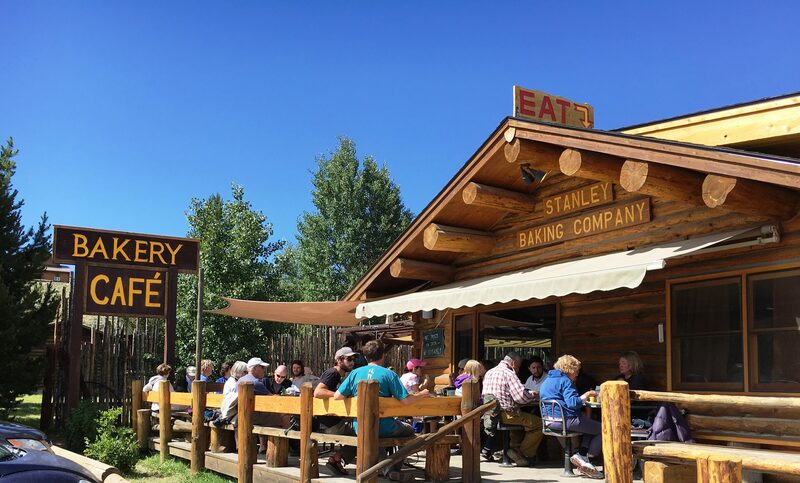 The lines for the Stanley Baking Company and Cafe always start before it’s 7:00 AM opening and as we do at most bars, cafés and diners when we are traveling, we sat at the bar or counter because it is a great way to meet people. 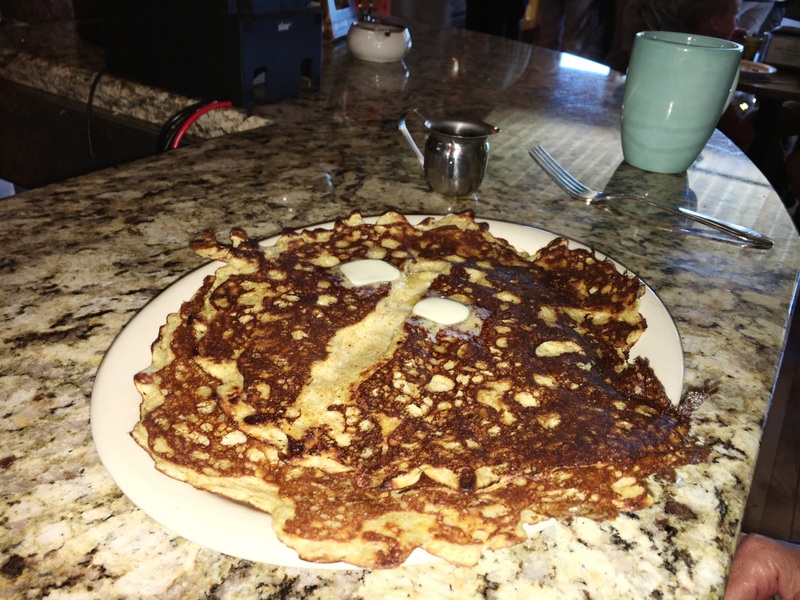 This was no exception as we started chatting with personable, Becky Cron, the co-owner with her husband Tim, who we also met and was cooking their outstanding pancakes and waffles. Becky, talking with Janet about her Oregon roots..
Becky, as did another person we met whose story is below, has an Oregon connection. 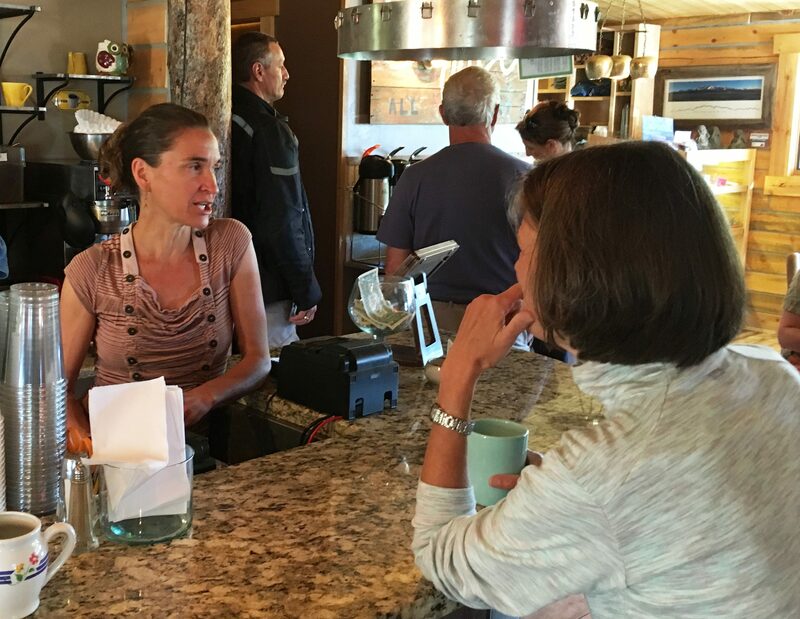 She was from Eugene and started skiing as a teenager at Sun Valley. 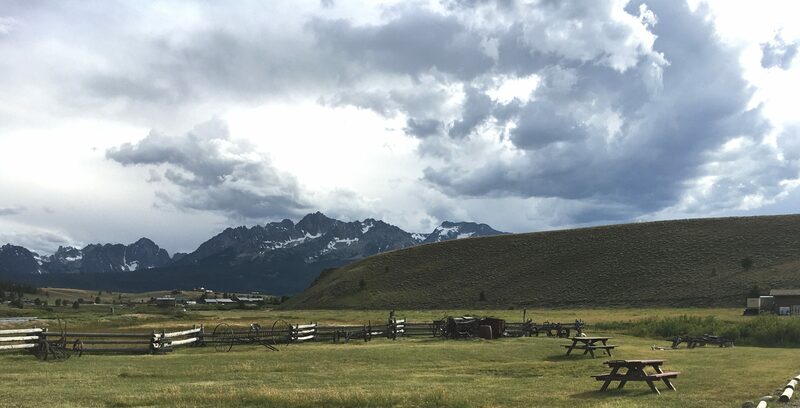 In 1989, she decided to move to Idaho for the skiing and the outdoors and never returned. 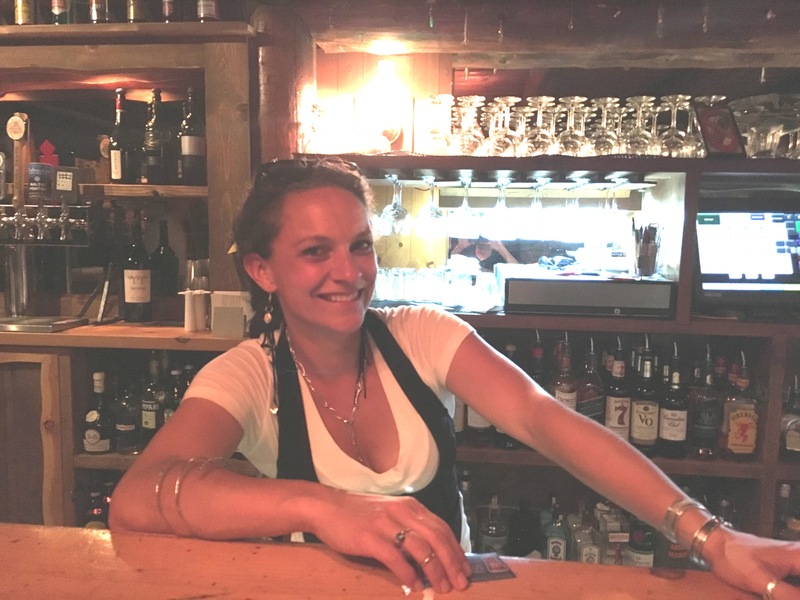 She met her husband and they own the Bakery and are co-owners of the nearby Sawtooth Hotel – both very successful enterprises. The hotel was built in 1931 and they renovated and reopened it in 2010. In spite of how busy she was, Becky was very friendly and willing to chat with some visiting Oregonians. And there was no question, the wait for their food was worth it. 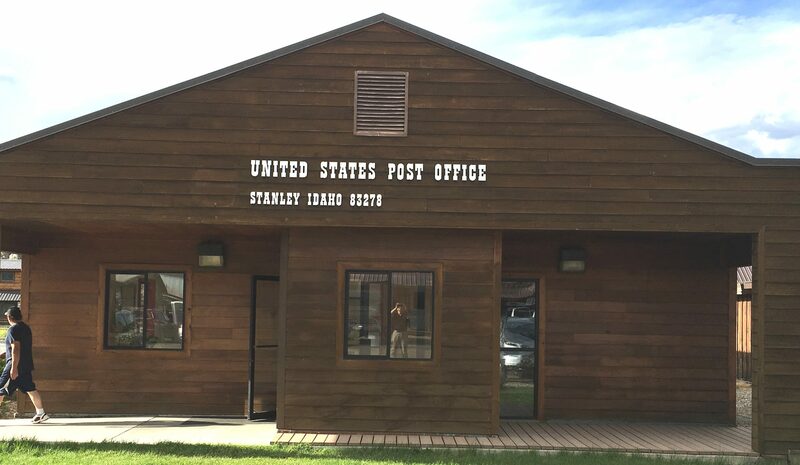 The first evening in Stanley, we dined at the Redd Restaurant, a quaint diner – also with a small waiting line and Janet enjoyed a pasta dish while I downed a scrumptious bowl of lamb stew. 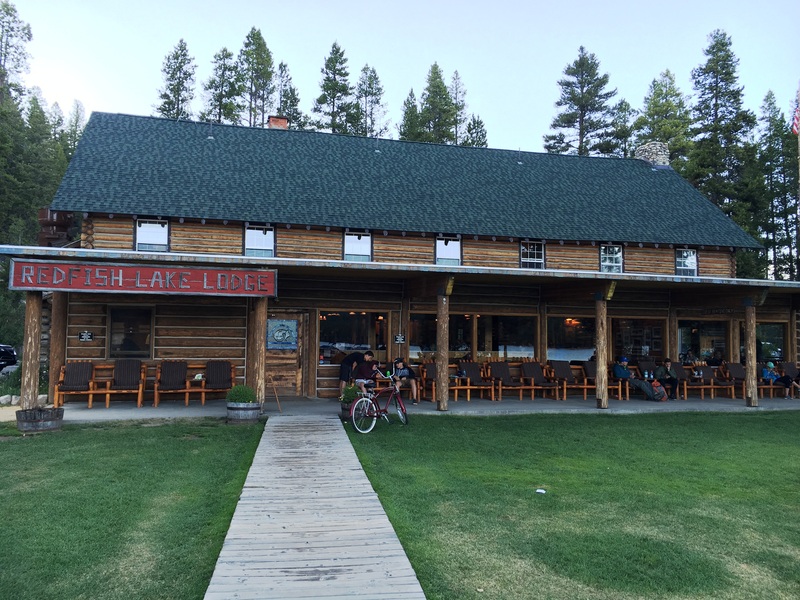 We stayed at the Lodge, built in 1929, for two nights, which had great rates and is in a beautiful setting. 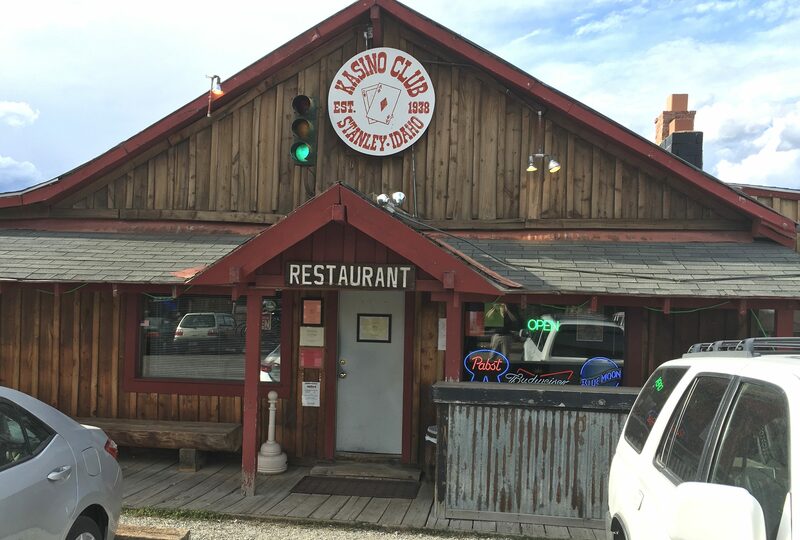 It’s essentially a log cabin, has a spacious and popular dining room and a small, but very interesting bar. 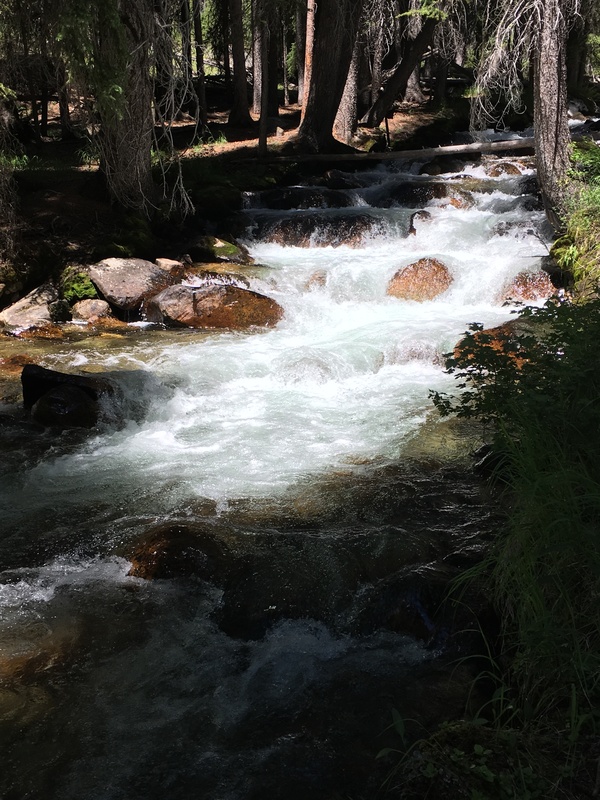 The next day, we took a boat ride to the end of Redfish Lake and went on a several mile hike along the ice-cold snow-fed streams running by the Lodge. Jen – in full control of her bar. 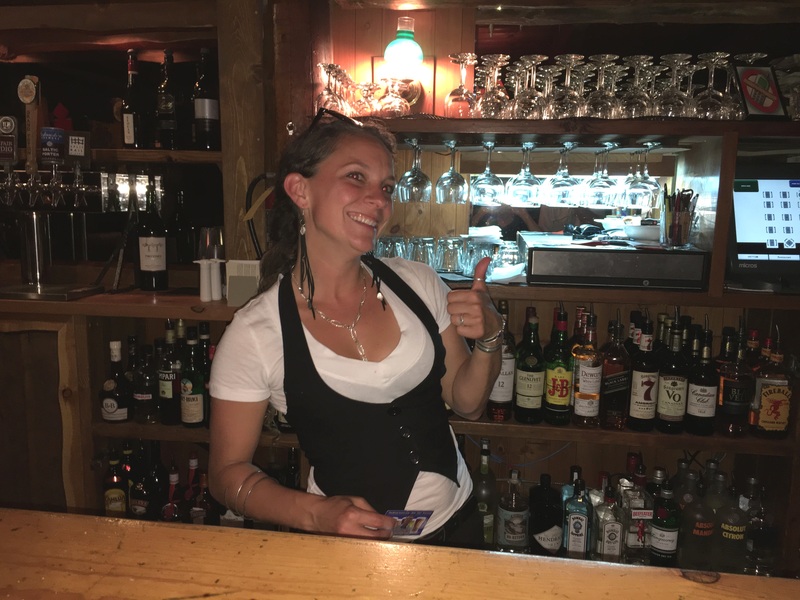 We met another colorful and unforgettable Stanley full-time resident – Jen Hettum – she referred to herself as “Crazy Jen.” And Jen, a charismatic, attractive and competent bartender, had that bustling bar under her thumb – she joked and chided each of the customers in a friendly manner and they loved it. She was like a school-marm with a revolving classroom of hyperactive kids, who knew they better behave or Jen would rein them in. Since the bar was so crowded the afternoon we first visited, I came back at 10:30 in the evening on a week night when the setting was more restrained and had a great chat when Jen after she poured me a Scotch and water. When I gave her Thebeerchaser card and told her we were on a road trip from Portland, she immediately related her Oregon connection. She now has a ten-year old daughter and is active in Stanley civic affairs and takes her profession seriously. In fact, the next week, she was attending a five-day national convention of “mixologists” in New Orleans, (Tales of the Cocktail) to which Jeff, the manager of the Lodge, was paying her way. The bar was a reflection of Jen’s magnetic personality and as I sat at the bar, I watched a guy who was with several friends come over and compliment Jen and then ask her to come to a party with him after she got off after midnight. “Ain’t going to happen, Sweetie, but I’m flattered you asked,” she responded and then went to the other end of the bar to serve another party. Of course, Jen, Johnny Ray, Becky and Tim all knew each other and probably socialize in mid-winter when Stanley essentially shuts down because of the cold weather. 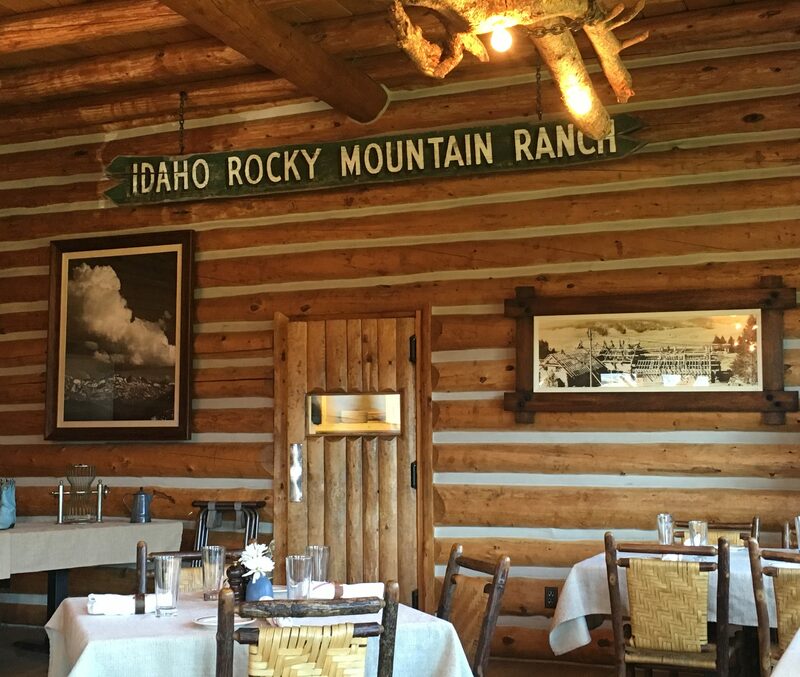 To cap it off, we had an absolutely great dinner at the beautiful Idaho Rocky Mountain Ranch (IMRM) about fifteen miles south of Stanley. 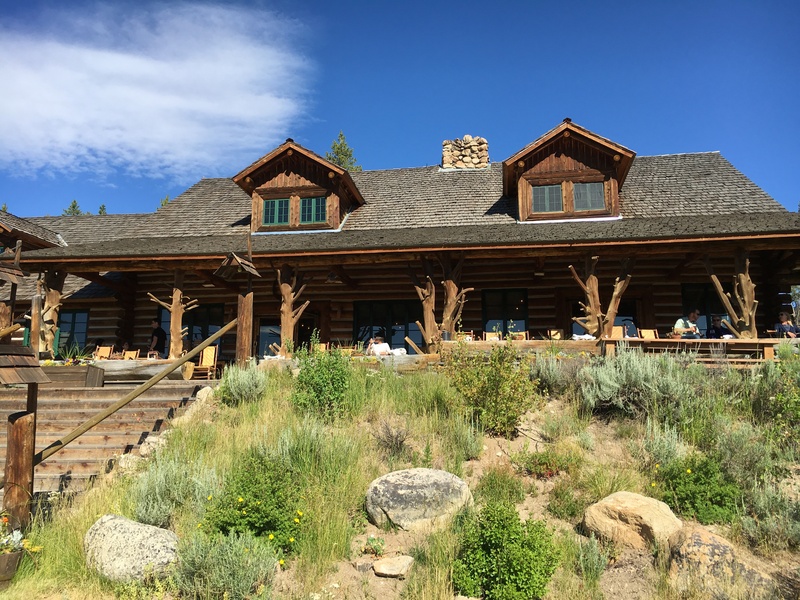 While waiting for dinner, we sat in rocking chairs on the expansive front porch with cocktails, admiring the beautiful mountains and forest. 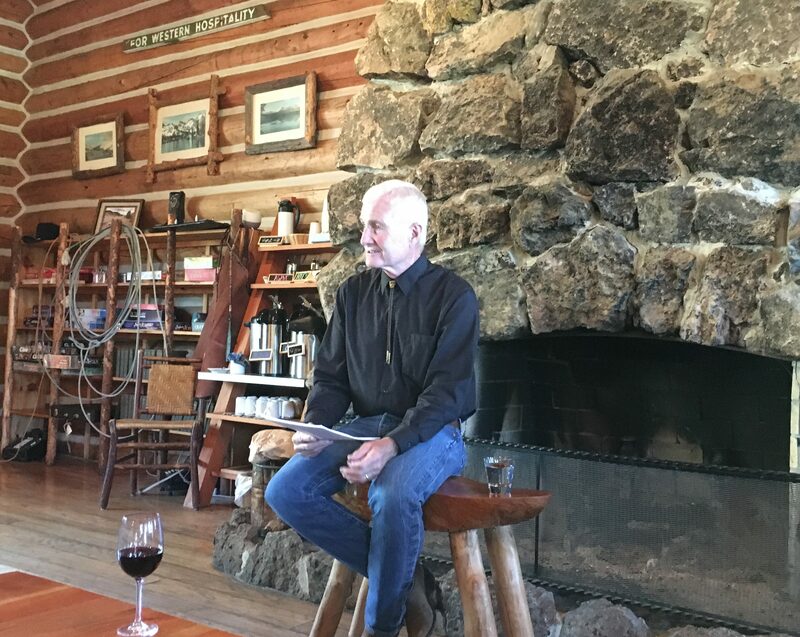 We even got a bonus with a reading by Idaho author and Stanley native, John Rember, who read from his memoir, Traplines – Coming Home to Sawtooth Valley. Our server at dinner was one of the many wonderful young people hired at IRMR from all over the country. She was from Boston and was starting college at the University of Chicago in the fall. After lamenting the brevity of our stay in Stanley, we left early the next morning after picking up two of Stanley Baking’s scrumptious and thankfully oversized cinnamon rolls. 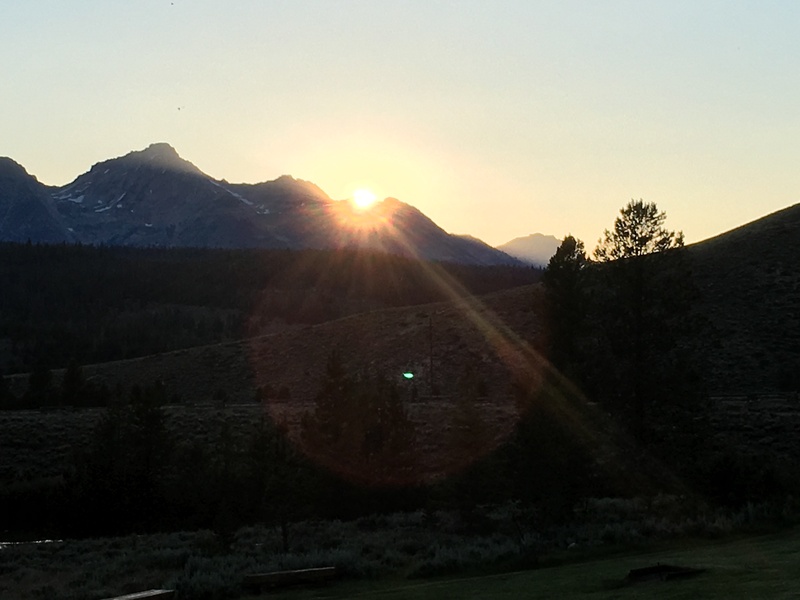 We made the 552 mile trip home from Stanley in eleven hours with great Idaho memories. Thanks, Becky, Tim, Johnny Ray, Eve and Jen. We hope you have a great winter and will see you on the next trip.